Have you ever wished you had a laser pointer to focus attention on a key point in a PowerPoint slideshow? 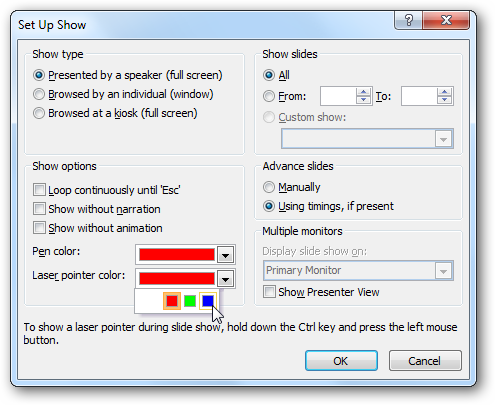 Today, we’ll take a look at how can use use your mouse as a laser pointer in PowerPoint 2010. Begin your slideshow by pressing the F5 key, or by selecting From Beginning or From Current Slide in the Start Slide Show group on the Slide Show tab. During the slideshow, hold down the Ctrl key and the left mouse pointer to make the laser pointer appear on the screen. Drag your mouse to move the pointer across the screen. You can change the Laser pointer color by selecting Set Up Slide Show in the Set Up group of the Slide Show tab. You can select from red, green, or blue from the Laser pointer color dropdown, then click OK. The Laser pointer is a very simple, but neat little feature added to PowerPoint 2010. Looking for more PowerPoint 2010 tips? Check out our earlier posts on how to animate text and objects, and how to add video from the web.